Herbs are essential ingredients for flavoring and spicing up recipes all over the world. Without them, eating would be pretty bland. Herbs add flavor, character, and uniqueness to recipes. Used alone or in combination, they help to make cooking fun and enjoyable, and eating a sheer joy! There are a wide variety of herbs which you can use. Depending on who is counting, there are 40 to 60 different kinds of herbs. Each one has it's own distinct flavoring. Most are easy to grow. There are annuals, perennials and even biennials. Aromatic- Grown for their scent, aromatics herbs are used in flower vases or dried arrangements. Their oils are used in perfumes, candles, and toiletries to name a few. A couple of favorites are Lavender and Mint. 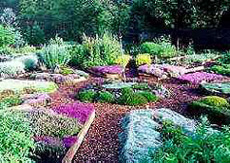 Herb gardens are fun and easy to grow. They also take up little space. Many growers put herb gardens up against their house or garage wall, so they can walk out and pick the herbs they need for the day's meal. Seeds can be sown indoors or out. Many seeds are very tiny and fine. Make sure not to plant them deeply. Just barely cover the seed and keep the top surface of the soil moist. Thin your seedlings according to the instructions on the seed packet. Few pests affect the herb family. In fact, some herbs, such as garlic, are used in organic pesticide formulas. Occasionally mites and aphids can bother a number of herb varieties. Did you know? It is the oil in herbs that gives herbs their aroma and flavor. Annual-Grows about 18 inches-There is many varieties, and they all can be grown by seed. Sow seed right into pot. Better not to use flats or plugs for they have a very long tap root. They don't like wet feet. Plant outside after frost. She loves hot weather. Also Basil is good for container planting. Just DO NOT OVER WATER. Do not let flower if you use for cooking. Plant between tomatoes as it repels flying insects. Basil is held in reverence as a plant filled with divine essence, and that is why the Indians chose this herb to swear their oaths in court upon. Sow seeds in early spring in flats or sow directly into the ground after all danger of frost. Keep pinching out young plants in the summer to promote new leaf growth and to prevent flowering. Harvest the leaves. Collect seeds of plants that are allowed to flower in the autumn before the frost. Pots may be brought into the house and set on a windowsill. Pick the leaves when young and always from the top to encourage new growth. If drying, do it as fast as you can. Basil leaves are some of the more difficult to dry successfully and I do not recommend it. The best way is to infuse the leaves in olive oil or vinegar. Basil is not used much today in herbal medicines, however, leaves added to food are an aid to digestion. It also can be used as a refreshing bath or when added to vinegar, acts as an antiseptic. The Welsh name for Borage translates as "herb of gladness". The Celtic word borrach means "courage". Annual-24". Seeds germinate quickly. Blue star shaped blooms form. Since this seeds so easily watch for flower heads turning into seeds and pick them of. Deadheading the flowers also will prolong flowering. She doesn't like to be transplanted. Makes a good companion plant. Bees love it. Also does not do well in pot inside. WARNING: Prolonged use of Borage is not advisable. Fresh leaves may cause contact dermatitis. Borage does best if sown directly where you want it to grow. Plant seeds in spring. Thin your seedlings to 24 inches apart and from other herbs, as they produce lots of floppy growth. Pick flowers fresh or if you want to freeze or dry them pick when they are fully opened. Cut the young leaves fresh all during summer. The leaves do not freeze or dry very well. Collect seed before the plant dies back fully. Borage tea is said to be good for reducing high fevers when taken hot. It produces sweat. It is a good remedy for colds and flu. Both leaves and flowers are rich in potassium and calcium and therefore good blood purifiers and a tonic. The Oswego Indians used it for colds and bronchial complaints. They also made tea from it called Oswego tea that was drunk in many American households, replacing Indian tea, following the Boston Tea Party of 1773. Perennial-18" to 3'.Has running roots so watch out it spreads. There are many varieties. The blooms come in red, purple, or light pink depending on variety. Grows well in moist soil, and they like semi shady spots the best. They will do well in full sun if they get lots of moisture. Remember to dig up and divide about every three years. Bee Balm is also called Bergamot. It does well in a very large pot or tub as long as the soil can be kept moist and it is given afternoon shade. This plant not only attracts bees, but butterflies and humming birds. Sow seeds in the spring. Also you can dig up 3 year old plants in the spring, divide and replant. It does tend to takeover. But I love it. In the fall cut back to the ground. Thought Bee Balm dies back in the winter it is good to protect with mulch, especially if you live in a real cold climate. It is excellent herb tea to relieve nausea, flatulence, menstrual pain, and vomiting. Catnip or Catnep has been for centuries grown in France where the young leaves and new shoots have traditionally been used as a flavoring. Perennial-24-30"-Likes sun or light shade, self seeds, and is very hardy. And it spreads like wild fire, but I love it. Planting near vegetables helps deter flea beetle. Butterflies are attracted to it too. Catnip can be planted in large pots. If grown in doors they can become leggy…Very aromatic. I can't kill it if even I wanted to . I love this herb. And it smells stronger if planted in the full sun. Bloom from June to September. Sow the seed in the spring or late summer in either the place where you want it to grow, pots, or seed trays. Thin to 12 inches. Cats adore this plant, and have been known to tear it to pieces in the herb bed. This herb can be used for a border or edging. Though mine has always been to tall for a border, but do plant it in the back of the bed, or on the sides. When the main flowering is over, catnip needs to be cut way back hard to encourage a second crop and to keep it neat and compact. Harvest leaves and flowering tops when young. Catnip is not often used for medicinal purposes. It is said to be excellent for colds and flu, and children's infectious diseases, such as measles. It soothes the nervous system and helps get a restless child off to sleep. It also helps to calm upset stomachs and counters colic, flatulence, and diarrhea. Also, an infusion can be applied externally to soothe scalp irritations, and the leaves and flowering tops can be mashed for a poultice to be applied to external bruises. "I am sorry to say that Peter was not very well during the evening. His mother put him to bed and made some chamomile tea and she gave a dose of it to Peter, one tablespoon full to be taken at bedtime"
Long ago chamomile was grown all around herb gardens in the belief that it would keep other plants growing near free from disease, and it was known as the "Plants Physician." (roman)-perennial-from 4" to 24''-Likes full sun. I don't plant it in full sun because it is to hot for it here on the east coast. So I plant it where it gets morning sun till around 1 o'clock. It has a wonderful scent. Can be grown in a window box or container, but does not do well in the house as it gets leggy. Chamomile has little daisy like blooms. Good for companion planting. WARNING; When taken internally, excessive dosage can produce vomiting and vertigo. Sow seeds in the spring. Divide established plants. During the summer do not let it dry out. Water well. Take cuttings in the spring and fall. They root easily. In the fall cut back to promote new growth. It is best to mulch in the winter for protection. It is said that when planted near ailing plants, it helps to revive them. Hence the saying “physician's plant". Medicinal The flower heads of German chamomile is highly scented and possesses powerful antiseptic and anti-inflammatory properties .Taken as a tea; it promotes gastric secretions and improves the appetite, while an infusion of the same strength can be used as an internal antiseptic. It is also used as a douche or gargle for mouth ulcers and as an eye wash.
Chives were a favorite in China as long ago as 3,000bc. Perennial-12"to18"-purple to white blooms. Loves the sun but will tolerate partial shade. In the spring every few years you should dig them up and separate the bulbs. Chives grow well in pots or windowsill gardens. Don't cut the green all the way down if you want to use them next season. Leave green stem for the bulb to nurse on. Planted next to roses they can prevent it from having black spot. Plant seed in late spring if planting directly outside. Cut back after flowering to encourage new leaf growth in the summer. Sprinkling the leaves onto food can stimulate the appetite and promote digestion. The Romans, who combined it with cumin and vinegar, rubbed it into meat as a preservative brought coriander to Northern Europe. Coriander has been cultivated for over 3,000 years. Seeds have been found in tomb from the 21st Egyptian dynasty (1085-945BC) The herb is mentioned in the Old Testament--"when the children of Israel were returning to their homeland from slavery in Egypt, they ate manna in the wilderness and the manna was as coriander seeds"--and it is still one of the traditional bitter herbs to be eaten at the Passover when the Jewish people remember that journey. The Chinese once believed it bestowed immortality and in the middle Ages it was put in love potions as an aphrodisiac. Its name is said to be derived from koris, Greek for "bedbug" since the plant smelled strongly of the insect. Annual-tender-24". Do not transplant well. Trust me here. So sow the seed where you want them to grow. Grows in sunny spot, and doesn't like to be wet. It has white blooms. Coriander may be grown in containers, and to be successful you need to keep picking the mature leaves. Sow sees in the spring, You can re-sow them in summer and also summer is the time to cut the leaves. In the fall cut seed heads, sow the autumn crop if you live in a warm climate. In the winter once the seed heads a re cut off the plant should be pulled up. Coriander doesn’t like to grow in humid areas, so I have a tough time with it. .Coriander is good for the digestive system, reducing flatulence, stimulating the appetite and aiding the secreation of gastric juices. Bruised seed can be applied externally as a poultice to relieve painful joints and rheumatism. Coriander seed is used in some soap and in toilet waters to add fragrance. Whole or ground seed is added to potpourri to blend the scents. And Coriander oils are used in perfumes. The name dill is said to have come from the Old Norse word "dilla" meaning to lull, an indications to the properties of the herb; dill water was given to babies to soother them. Annual-Grows from 2 to 5'-has tiny yellow flowers. Dill does not like being transplanted so would suggest sowing where you want them and then thinning. Self seeded. Can be grown in containers in sun, but will break easily from the wind. I only grow dill in the ground. To keep the plant stimulated with new growth, you need to keep cutting it for use in the kitchen. It doesn’t live as long when you do this, so it is good to do successive sowings, in other pots. Sow the seeds in the spring. During the summer cut to promote new growth. Harvest the seeds in the fall. And in the winter dig up all remaining plants. Dill self sows really well. To well! Dill is an antispasmodic and calmative. Dill tea or water is a popular remedy for an upset stomach, hiccups, or insomnia. For a nursing mother it promotes the flow of milk. It is also an appetite stimulant. It is a constituent of gripe water and other children's medicines because of its ability to ease flatulence and colic. The seed, whole or ground is a valuable replacement for salt where a salt free diet must be followed. Try chewing the seeds to clear up halitosis and sweeten the breath. Crush and infuse seeds to make a nail strengthening bath. Fennel is one of our oldest cultivated plants and was much valued by the Romans. "So gladiators fierce and rude/ mingled it with their daily food. And he who battled and subdued/ a wreath of fennel wore (Henry Wadsworth Longfellow). It was also one of the nine herbs held sacred by the Anglo-Saxons for its power against evil. Charlemagne declared in 812A.D. that fennel, with healing properties also to its credit, was essential in every imperial garden. Perennial. Grows to about 7 '. To me it resembles dill. Fennel likes loamy soil. Not clay. It does need to be protected from the mid-day sun and don't plant next to dill. It will cross-pollinate. Fennel has small yellow blooms. And can be grown in large containers but you will have to stake the stems. WARNING: Taken in large doses, the essence can cause convulsions and disturb the nervous system. Sow the seeds in the spring of all varieties. During the summer pick the flowering heads to maintain leaf production. During the fall cut back old growth. Fennel will die back into the ground in winter. Mulch if you live in a very cold climate. To harvest pick young stems and leaves as required. Freeze leaves or infuse in oil or vinegar. Fennel tea is good to aid digestion, or prevent both heartburn and constipation. A teaspoon of this cooled tea is good for babies with colic. Steep a compress in the tea and place on the eyelid, to ease inflammation or watery eye, or bathe the cooled solution on the naked eye. Foxglove grows throughout Europe and in North America and is a common wildflower in warm climates throughout the world. The common name probably derives from the Anglo-Saxon foxglue or foxmusic, after the shape of a musical instrument. Judging by its other names, it would seem that it was also thought to be a fairy's plant or a goblin's plant, at least in England. Its appearance-its height, the glove shape of the corolla, and the poison of its leaves-seems somehow to beg for its own folklore. In 1542, Fuch called it Digitalis after the fingerlike shape of its flower but he considered it a violent medicine and it was not until the late 18th century that William Withering used foxglove tea in Shropshire for dropsy that its reputation as a medicinal herb grew. Perennial. Grows from 3' to 5" tall. Mine have grown well in full sun and partial shade. They are pretty easy to grow, doing most of the work themselves. Their blooms are beautiful. White, pink, purple, red, and yellow.. I only grow foxgloves for their beauty. And it wasn't until my children were grown that I ever purchased a plant. The heart drug digitalis is made from the second-year leaves WARNING: Do not grow these if you have small children, or dogs that like to nibble plants. They are poisonous. Sow seeds in the spring, or plant out the first year plants. Remove the main flowering shoot after flowering in the summer. In the fall check for self sown seedlings and thin out if the plant is a second year one. Pot a few of the seedlings in case of an exceptionally hard winter. In most cases protection is not needed but if you live where it freezes and stays cold a long time I would mulch. Foxglove does its best in semi-shade but will grow in hot sun. I have some in full sun, that take a beating all summer and then two in the semi-shade that do beautifully also. Garlic originates from India or Central Asia and is one of the oldest plants. Odysseus used Moly, a wild garlic, as a charm to keep the sorceress Circe from turning him into a pig. The Egyptians used it medicinally. The common name is said to have been derived from the Anglo-Saxon leac, meaning "pot herb," and gar, a "lance," after the shape of the stem. During World War 1, sphagnum moss was soaked in garlic juice as an antiseptic wound dressing. An old country remedy for whopping cough was to put a clove of garlic in the shoes of the whooper. Garlic was thought to guard the eater against the plague. In England in the Middle Ages it was also given to those suffering from leprosy in the belief is would cure them. Garlic (allium sativum) is a strong smelling herb and a member of the onion family. Its leaves are grass-like, flat, and with a single stem. The flower head is a ball of small purplish-white flowers clustered together, blooming in August and September. The plant has no smell until crushed. Garlic is a very easy herb to grow. Plant the bulbs directly in the ground in early fall. Plant in full sun, in good light soil, that is well-drained. Traditionally garlic cloves are planted on the shortest day of the year and harvested on longest. Split the bulb and plant individually, pointed end up, into holes 1in deep. Ease the bulbs out of the ground when the leaves die down and lose their greenness (mid to late summer). Dry in the sun for a few days if rain is not expected, otherwise in the house. Hang them up in a string bag, or plait them into a garlic string. You can plant garlic in a pot in the spring and put it in a sunny windowsill. Harvest the leaves as one would chives. It is said that Garlic helps to prevent leaf curl in trees, especially peaches. Also, when planted next to roses it wards off black spot. Garlic has shown to reduce blood pressure, and useful in guarding against strokes. It has helped in controlling diarrhea, dysentery, TB, whooping cough, typhoid, and hepatitis. And it can be use to expel worms. It is also used for toothache, earache, coughs and colds. A decaying tooth will hurt less if packed with garlic pulp until treatment can be obtained. Externally, garlic can be applied to insect bites, and boils. Warning: Can irritate the skin. This herb was originally native of South Africa. Nearly all of the species of scented geranium came from the Cape of South Africa to England in the mid-17 century. The Victorians loved the aromatic foliage. In the early 19th century the French perfumery industry recognized its commercial potential. Oil of geranium is now not only an ingredient of certain perfumes for men, but also an essential oil in aromatherapy. There are many different varieties of scented geraniums. All are tender to frost. Geraniums can be propagated by softwood cuttings which usually take well in the summer. Place cuttings into a tray containing equal parts bark and peat. Water and do not put into direct sunlight. The cuttings should root in 2 to 3 weeks. I usually do this in late summer so that I can have plants by late spring to plant. I also plant the whole pot in the spring after danger of frost. Though last year we had a sneak in frost and I lost all four of mine. They do excellent in a container. Place the containers so that they will brush against you as you walk by so you may enjoy the scent. Geranium oil is relaxing, but use it in small quantities. Dilute 2 drops in 2 teaspoons of soy oil for a good massage, or to relieve premenstrual tension, dermatitis, eczema, herpes, or dry skin. Pick leaves during the growing season, for fresh use or drying. Horseradish is a native of Europe. Originally the horseradish was cultivated as a medicinal herb. Now it is considered a flavoring. The common name means a coarse or strong radish, the prefix horse often being used to indicate a large, strong plant. Horseradish is a hardy perennial that grows to about 24-25 inches. Sow the seeds in the spring, or plant cuttings. Also in the spring separate the clumps from last years planting. Dig up the roots if you plant on using them in the fall. There is no need to mulch as they are very hardy. Horseradish is invasive. Once you grow it. It's yours to keep so to speak. It said that you should grow horseradish near potatoes to improve their disease resistance, but CAUTION, it can take over your garden. Warning: Overuse may blister the skin. Do not use it if your thyroid function is low or if taking thyroxin. Avoid continuous dosage when pregnant or suffering from kidney problems. Horseradish is a powerful circulatory stimulant with antibiotic properties. It is also effective f or lung and urinary infections. Grated into a poultice it can be applied externally to stiff muscles and joints to stimulate blood flow. The roots and the leaves produce a yellow dye for natural dying. Slice and infuse in milk for a lotion to improve skin clarity. Lady's mantle is a native of the mountains of America, Europe, and Asia. It likes damp places but also shady dry woods. In the Medieval period it was dedicated to the wise women of the woods. The herb came to be known as lady's mantle because of the scalloped shape of its leaves, Lady’s Mantle is believed to grow wild were the wise women live. The crystal dew lying in perfect pearl drops on the leaves have long inspired poets and alchemists and it was said to have healing and magical properties, even to preserve a woman's youth provided she collected the dew in May, alone, in full moonlight, naked, and with bare feet as a sign of purity and to ward off any lurking forces. Lady's Mantle was also considered a woman's protector, and nick named " a women's best friend", and used to reduce regulate the menstrual cycle, and to ease the effect of menopause. In the 18th century the leaves were applied to woman's breast to help them recover shape after they had been swollen with milk. Lady's Mantle is a hardy perennial. It grows anywhere from 6 inches to 18 inches tall. It bears tiny greenish yellow flowers in the summer. It can be grown in semi-shade to full sun, but dose not really wet areas. Raising from seed can be hard, though it self seeds just fine. Sow seeds in the spring and divide established plants. If you don't want it to self seed cut off flower heads as they begin to die back in the summer. Again divide established plants if necessary and sow seed in the fall. Cut young leaves after the dew has dried for use throughout the summer. Lady's mantle can be grown in a container. Lady's mantle is used for menstrual disorders. It has been said that if you drink an infusion of green parts of the plant for 10 days each month it will help relieve menopausal discomfort. It is also used as a mouth rinse after tooth extraction. Leaves can be boiled for pale green wool dye and are used in veterinary medicine for the treatment of diarrhea. A very popular herb, and an herb with many varieties. Lavender is native of the Mediterranean region, Canary Isles and India. The Romans used lavender in their bath water: the word is derived from the Latin lava, to "wash". Romans introduced this plant to Britain, and from that time on Monks cultivated it in their gardens. There went a long period of time that little was recorded about lavender. It was then brought in quantities from herb farms to the London Herb Market at Bucklesbury. "Who will buy my lavender?" became the famous of all London street cries. It was used as a strewing herb for its insect-repellant properties. It was also carried in nosegays to ward off the plague. In France in the 17th century fields of lavender were grown for the perfume trade. English lavender is a lovely, aromatic evergreen shrub growing from 1-3 feet high. The leaves are grey green and are narrow and the flowers are blue, pink, purple, or white depending on the variety. Lavender likes light soil that is well drained and a sunny position. Seeds should be sown in the fall. In the spring, give your already established lavender a pruning. Take cutting's to root. Trim in the summer after it flowers. Do not cut back in the fall. Just leave the plant alone. If you have seeds planted in a seed plug be sure to water over the winter. Gather the flowers just as they open, and dry on open trays or by hanging in small bunches. Pick the leaves anytime for fresh use, or before flowering if drying. Lavender may be grown in a container. Protect it in the winter by keeping in a cool bright place. Allow the soil to dry out in winter, not totally but close. Slowly reintroduce watering in spring. I keep my containers under the pool deck for the winter and it does just fine. It gets water that comes through the decking above it. Lavender has been used medicinally to soothe, sedate, and suppress. The essential oil is in great demand today. Traditionally the oil was inhaled to prevent vertigo and fainting. It is an excellent remedy for burns and stings, and it is used to heal cuts. They say if you add 6 drops of oil to bath water it will calm irritable children and help them sleep. Place 1 drop on the temple for a headache. The best oil is made from distillation and may be bought from many shops. Lavender makes a good moth repellent, and is used for beauty care. This ancient herb was dedicated to the goddess Diana, and used medicinally by the Greeks some 2,000 years ago. The generic name, Melissa, comes from the Greek word for "bee" and the Greek belief that if you put sprigs of balm in an empty hive it would attract a swarm. Thus, if you planted close to a hive then the bees would never go away. This belief was still prevalent in medieval times when sugar was highly priced, and honey a luxury. In the Middles Ages lemon balm was used to soothe tension, to dress wounds, and as a cure for toothache, skin eruptions, mad dog bites, crooked necks, and sickness during pregnancy. It was even said to prevent baldness, and ladies made linen or silk amulets filled with lemon balms as a lucky love charm. It has been said the world over that Lemon Balm was good for promoting long life. Lemon Balm grows to about 3'. The flowers are a pale yellow and it blooms from July to September. Bees are attracted to the scent, especially when the leaves or stem have been bruised. Plant in full sun, with a little shading in the noon day sun. Sow your seeds in the spring, and divide established plants. Keep trimming the established plants in the summer, cut back after flowering to help prevent self seeding. In the fall divide established plants, or transplant any that may be sneaking all over the bed. Mulch in the winter if you have severely cold weather. To harvest: Pick leaves throughout the summer for fresh use. For drying, pick just before the flowers begin to open when flavor is best. Don't bruise. It does not keep for a long time loosing much of its therapeutic value. Lemon Balm can be grown in a container. Medicinal Lemon balm tea is said to relieve headaches and tension and it helps restore memory. Try drinking it after meals to ease digestion, flatulence, and colic. Use fresh or frozen leaves in infusions, for the oil tends to disappear during the drying process. The oil used in aromatherapy is recommended for nervousness, depression, insomnia, and nervous headaches. Lemon balm is one of my favorites. Though it does tend to creep around the beds, but I just transplant into a bare spot somewhere else. Lemon verbena originated from Chile. It was introduced into Europe in the late 18th century and lemon verbena tea been popular in France and Spain ever since. If Lemon verbena is grown in a sheltered area it can grow up to 6 feet. The leaves are narrow, and deeply veined and they grow in groups of three up the stem. Lemon verbena is not a hardy shrub. It is actually quite tender and will need to be protected in the winter. I use to bring mine in, but now I just mulch really heavy. So far so good It must be planted in well drained soil, facing south. Stem cuttings may be taken from an established plant at any time during the growing season. In the spring trim established plants. Take softwood cuttings to root. After flowering in the summer trim. In the fall cut back, but not hard. Bring in before frost. Pick the leaves anything before they start to wither and darken. Leaves dry quickly and easily, keeping their color and scent. Store them in a damp-proof container. Lemon verbena can be grown in a container. Treat like the ground grown plant except being sure it is watered will. In the winter move into a cold greenhouse, or sun lit barn and let dry out. A cup of tea before bed time has mild sedative properties; it can soothe bronchial and nasal congestion and ease indigestion. Though you should not use for a long term. It can cause stomach irritation. In the 16th century marigold was a common garden plant valued by herbalists for comforting the heart and soothing the spirit. The dried flowers went into the making of broths and teas, and were used to add color to cheese. The Egyptians valued the marigold (Calendula) as a rejuvenating herb, and the Greeks garnished and flavored food with its golden petals. In India wreaths of calendula were used to crown the gods and goddesses. In medieval times they were considered an emblem of love and used as chief ingredient in a complicated spell that promised your maidens knowledge of whom they would marry. To dream of them was a sign of all good things; simply to look at them would drive away evil. During the Civil War, calendula leaves were used by doctors on the battlefield to treat open wounds. Be sure the Marigold that you purchase says Calendula officinalis. These daisy like flowers are a hardy annual. They grow to about 24" and spread about the same. They prefer a sunny location, and they don't like large changes in the weather. When their flowers are opened it is a forecast of a nice day. It self seeds very well and the seeds should over winter well in the ground as long as the temperatures do not go persistently below 32'F. In the spring you can sow the seeds in the garden. During the summer, deadhead flowers to promote more flowering. In the fall seeds can be sown again under protection for early spring flowering. Protect young plants in the winter. Pick flowers just as they open during the summer. Marigold can be grown in containers but don't do well in hanging baskets, where they droop and look messy. Treat as a plant in the flower bed, by pinching out the growing tips, and deadhead flowers to encourage more blooms. Calendula flowers contain antiseptic, anti-fungal, and anti-bacterial properties that promote healing. You can make a compress of the flowers for burns, scalds, or stings. It is also used in the treatment of impetigo. A cold infusion may be used as eyewash, and can help in the treatment of thrush. It is said that the sap from the stem has a reputation for removing warts, corns, and calluses. There are many skin and cosmetic preparations that contain calendula. Infuse the flowers and use as a skin lotion to reduce large pores, nourish and clear the skin, and clear up spots and pimples. In Greek mythology, Minthe was a nymph beloved by Plute, who transformed her into this scented herb after his jealous wife took drastic action. Or, another version: The nymph Minthe was being seduced by Hades, God of the Underworld. His queen Stephanie became jealous and turned her into the plant, mint. Mint has be upheld highly ever since, its value being epitomized by biblical references to the Pharisees collecting tithes in mint, dill and cumin. The Hebrew laid it on synagogue floors, and this idea was repeated centuries later in Italian churches, where the herb is called Erba Santa Maria. Mint as a symbol of hospitality is mentioned by the Roman poet Ovid, who wrote of two peasants, Baucis and Philemon, who scoured their serving board with mint before feeding guests. The Romans also flavored wines and sauces with mint. However, when women who drank wine were threatened with death, secret drinkers would mask their breath by chewing a paste of mint and honey. In Japan, the refreshing, restorative scent of mint was so highly prized that the Japanese wore pomanders of its leaves. Many mint varieties had been introduced into Europe by the ninth century. A monk writing during this time said that there were so many he would rather count the sparks of Vulcan's furnace. With more than 600 varieties, the best way to pick a good plant is by nose rather than by name. I have listed here a few of my favorites because there are just so many to choose from. Ginger Mint, Peppermint, Lemon mint, Pennyroyal, Curly Mint, Apple Mint, CHOCHOLATE mint, Orange mint, Kentucky mint....oh my you see. The list goes on and on.